The Wickhams: Christmas at Pemberley at the Jungle Theater through December answers the age-old Jane Austen fandom questions; “Does Wickham ever get his just deserts?” and “Who is the real Lord of Pemberley?” I won’t spoil the former, but the latter is a resounding Mrs. Reynolds the housekeeper! In this clever, delightful and very entertaining “side-quel” to Jungle Theater’s 2017 Miss Bennet, playwrights Lauren Gunderson and Margot Melcon imagine what’s happening in the Pemberley kitchen as the master’s family celebrates Christmas in an “Upstairs, Downstairs” meets “Pride and Prejudice” adaptation, a Jungle co-commissioned world premiere. Last year’s successful Miss Bennet, which also freshly imagined a Bennet sister Christmas reunion from the point of view of the much overlooked Mary Bennet, was the impetus for this commission and demonstrates that Gunderson and Melcon are not afraid to take on Austen’s beloved characters in reverent but new ways. Jane Austen fans and their companions will love the respectful nod to the original material but also the new characters and plots. Angela Timberman is superb as Mrs. Reynolds, the real Lord of Pemberley, giving her character a sharp-witted intelligence, fierce motherly countenance and a sense of humor dripping with sarcasm. 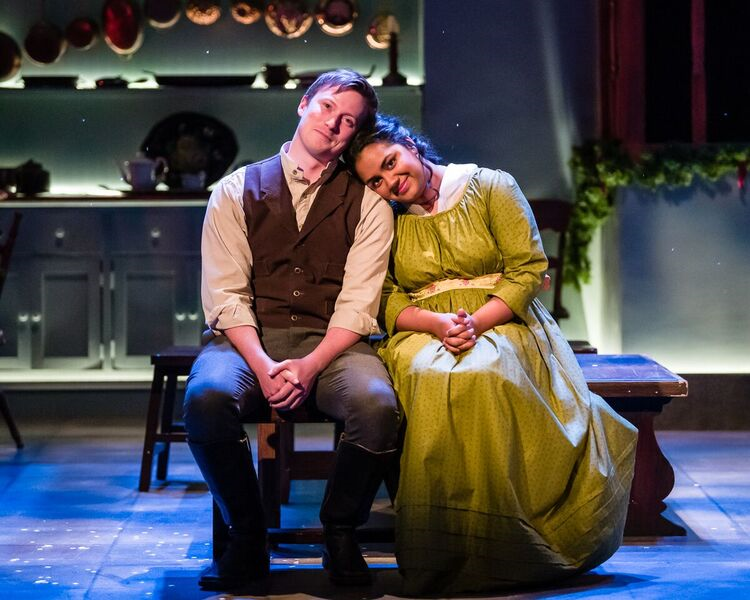 Roshni Desai (Cassie) and Jesse LaVercombe (Brian) are adorable as friends-since-childhood servants at Pemberley who discover their budding mutual affection and places in the world. Reprising their roles in Miss Bennet are Sun Mee Chomet (Elizabeth Bennet Darcy), Kelsey Didion (Lydia Bennet Wickham) and James Rodríguez (Mr. Darcy). Didion is hysterical as the flighty and self-centered Lydia Bennet. Didion played Mercutio in Guthrie Theater’s 2017 Romeo and Juliet and I find her performances thrilling in their energy and physicality. She is an actress to watch. Nate Cheeseman as George Wickham gives his character the smarmy charm and self-destructive desperation we expect in Wickham. The play takes place in the Pemberley kitchen as preparations for the Bennet and Darcy family Christmas reunion unfold. Mrs. Reynolds must train new servant Cassie, while reining in the enthusiasm of would-be inventor and footman Brian. Added to the chaos is lingering worry over Lydia Bennet’s marriage to George Wickham and his banishment from Pemberley. Scandals are revealed and the spirit of Christmas reigns as servants and family navigate the chaos that is the Christmas holiday. If you have never read Jane Austen, you will still love this family holiday celebration and the characters that inhabit it. The Jungle offers post-show Stay Late discussions after every performance of The Wickhams to give audience members the opportunity to ask questions and talk about the play’s themes. Performances are Tuesdays ($40), Wednesdays ($40), Thursdays ($40), Fridays ($50) and Saturdays at 7:30 p.m. ($50), and Sundays at 2 p.m. and 7:30 p.m. ($45) with no performance on Christmas (December 25). Preview performances ($15) are November 28-29 at 7:30 p.m. Rush tickets are offered every night of the week, based on availability two hours prior to the performance, and there is special Friday night pricing for students, 55408 neighborhood residents and employees, and those under 30 years of age. December 3, 2018 in Uncategorized. Miss Richfield 1981: We’ll All Be Dead By Christmas!